TAIPEI — Vietnam’s efforts to modernize its armed forces face numerous barriers in the political, historical and financial barriers. realm. Many are of Vietnam’s own making — its go-slow policy on human rights issues and democratization, and the Communist Party's reluctance to share power, even though it has embraced foreign investment and capitalism. Still, growing problems with China are forcing Hanoi to ask hard questions about its future military needs. Since the collapse of the US-backed South Vietnamese government in April 1975, Hanoi has relied on Russian/Soviet-built equipment and support for a wide array of anti-ship missiles, fighter aircraft, tanks and more recently, six Russian Kilo-class submarines. "Vietnam has a huge military, but most of it is still outfitted with weaponry from the 1970s and 1980s, especially the Army," said Richard Bitzinger, a senior fellow and coordinator of the Military Transformations Program at the S. Rajaratnam School of International Studies, Singapore. Vietnam's armed forces must now invest steadily in acquisitions for the next decade or two "if it wants to fully recapitalize its military," he said. During the 1978 Vietnamese invasion of Cambodia and China’s 1979 punitive incursion into northern Vietnam, these weapons were adequate for Vietnam’s needs. But with the fall of the Soviet Union, affordable Russian weapons declined as did the quality, while and the Vietnamese armed forces suffered proportionately as China’s military modernization effort, particularly naval, strengthened. The wake-up call came with China’s increased presence in the South China Sea and its recent land reclamation efforts to build artificial islands for military grade airfields and naval port facilities. China exacerbated Vietnam’s fears by placing a massive oil drilling exploratory platform within Vietnam's China’s exclusive economic zone in May 2014. Now known as the "Haiyang Shiyou 981 standoff," the incident caused widespread violence in Vietnam as citizens attacked Chinese-owned factories. Agitation was further heightened when Vietnamese television stations played a 1988 video of the "Johnson South Reef Skirmish" in the Spratly Islands between the Chinese and Vietnamese navies. The gruesome video shows Chinese naval personnel machine-gunning 66 unarmed Vietnamese standing around a Vietnamese flag on the reef in knee-deep water. After the battle, China quickly occupied the reef and built shelters. The US defense industry has been anxious to enter the market, but arms export restrictions are still in place due to human rights allegations and the one-party Communist system. Much of this pressure continues to be applied on the US government by South Vietnamese exile groups lobby the US Congress to continue these bans until there are improvements. However, the US ban on exporting lethal weapons to Vietnam will likely be overturned, said Tony Beitinger, vice president, Market Intelligence, AMI International Naval Analysts & Advisors. Vietnam is coming to the end of a five-year planning cycle. Early next year, priorities for the next five years (2016-2020) will be announced when the Vietnam Communist Party convenes its 12thtwelfth National Party Congress, said Carl Thayer, fellow, Australian Defence Force Academy. The Obama administration has relaxed International Trafficking in Arms Regulations (ITAR) on the sale of lethal weapons to Vietnam on a case-by-case basis, but most of the emphasis has been on maritime security and weapons of a defensive nature suitable for Vietnam’s Coast Guard. The US government has announced it will provide $18 million for to provide patrol boats for Vietnam Coast Guard patrol boats. The Pentagon also announced $425 million for its Pacific Partnership program. The funding will cover equipment, supplies, training and small-scale construction. "These are very modest initiatives. Funding for the Pacific Partnership program will be made in five installments: $50 million for FY 2016; $75 million for FY 2017; and $100 million for FY 2018, 2019 and 2020. These funds will be spread out among five countries: Indonesia, Malaysia, the Philippines, Thailand and Vietnam," Thayer said. In June, US Defense Secretary Ash Carter and Vietnamese Minister of National Defense Gen. Phùng Quang Thanh Gen. Thanh signed a US-Vietnam Joint Vision Statement on Defense Relations. This document included 12twelve areas of defense cooperation, including expanded defense trade and cooperation in the production of new technologies and equipment, "where possible under current law and policy restrictions," Thayer said. Also that month it was reported that Vietnam was looking beyond Russia to purchase maritime patrol aircraft, unarmed drones and jet fighters, and has been in contact with Lockheed Martin and Boeing. "It is unlikely that Vietnam would want to or be able to purchase jet fighter aircraft from the United States. But it is likely that US defense firms could assist Vietnam with maritime patrol aircraft, unarmed drones and naval patrol craft," Thayer said. Lockheed Martin has publicly promoted the possible sale of its Sea Hercules maritime patrol aircraft and Boeing has publicly indicated that it has capabilities in "intelligence, surveillance and reconnaissance platforms that may meet Vietnam’s modernization needs." For example, Boeing could sell its maritime surveillance technology to Vietnam for installation on a business aircraft converted for maritime reconnaissance, Thayer said. There are several niche areas of potential defense trade for the US, including coastal radar, satellite communications, maritime logistics, maintenance and electronics. More problematic areas of defense trade include air defense systems for naval ships and anti-submarine warfare technology, Thayer said. Beitinger said Vietnamese acquisition of platforms with complex weapons and sensors from Western sources will be challenging in terms of integration integrating new systems and establishing training and logistic support. "Implementation of Western systems into the Vietnamese Navy will allow for great interoperability with regional navies from Japan, Australia, South Korea, the Philippines and the US," he said. Thayer said Vietnam's desire to purchase four 1,600-ton Sigma-class corvettes from the Dutch Damen Group, with two corvettes to be produced in Vietnam, has fallen through over finance arrangements. This development probably does not open doors for the US defense industry because the armament Vietnam requires would not be provided under current legislation. While many Asia-Pacific nations are investing in a wide range of larger surface ships and submarines, as part of fleet expansions, the need for small, fast and capable craft remains greater than ever, said Amy McDonald, naval analyst at AMI International Naval Analysts & Advisors. "The growth in maritime security challenges — from piracy to fisheries enforcement, to countering illegal smuggling and trafficking at sea — requires more and better maritime presence." McDonald said this expanding role for smaller ships and vessels to fill these gaps is evidenced in Vietnam’s current and planned acquisitions — small fast attack craft, offshore patrol vessels, frigates and submarines — all of which are around or less than 100 meters. "While the top five5 Asia-Pacific spenders [India, South Korea, Japan, China and Australia] account for almost 75 percent of total forecasted investment in the region through 2034, Vietnam represents over 22 percent of projected fast attack craft spend," McDonald said. "AMI anticipates investment in smaller surface ships and craft will remain steady as Vietnam continues exclusive economic zone patrols in the South China Sea." Beyond the US, Vietnam has signed a wide number of memoranda of understanding (MoU) and defense cooperation agreements (DCA) with foreign states. These agreements reveal that Vietnam is seeking assistance, services and equipment acquisitions in six major areas: the storage, maintenance and upgrading of existing military equipment; modernization of platforms and equipment for the Army, Navy and Air Force; modernization of Vietnam’s defense industry; maritime logistics capacity in the South China Sea; mitigating the effects of natural disasters, notably flooding and storm damage, and search and rescue at sea; and finally training for future involvement in United Nations-endorsed peacekeeping operations, Thayer said. Vietnam's defense MoUs and DCAs usually contain general clauses on bilateral defense industry cooperation in five priority areas: promotion of defense research and technology transfer; co-production of weapons; maintenance, upgrading and repair; technical support; and personnel training, he said. Vietnam's arms purchase contracts invariably include provisions for technology transfer as well as training and services. For example, Vietnam has approached Russia and India for assistance in co-producing the BrahMos anti-ship cruise missile. Vietnam also has supported a Malaysian proposal to promote defense industry cooperation among ASEAN members. Vietnam and Indonesia have discussed co-producing fixed-wing transports, maritime surveillance aircraft and multirole helicopters. Vietnam and the Philippines have discussed cooperation in the manufacture of various types of unspecified military equipment. Vietnam has also approached Singapore for assistance in the safe storage of ordnance and munitions. Vietnam's defense industry is capable of constructing small naval patrol craft. In 2011, for example, the Hong Ha defense shipbuilding company successfully launched a 54-meter 400-ton fast patrol boat (Project TT400TP), based on a Russian-design, and a 72-meter troop transport vessel. 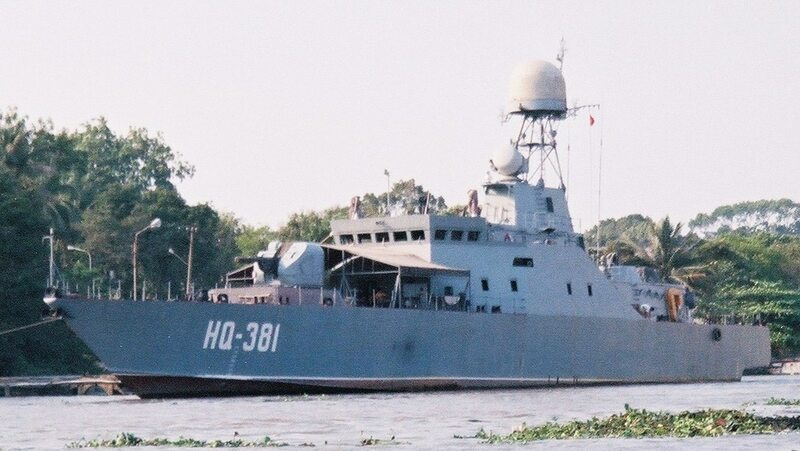 Vietnam has a history of local production of Russian-designed ships going back to the 1990s with the HQ-381 BPS 500-ton class guided missile patrol boat.